[vc_row][vc_column][vc_column_text]LUTZ FINGER: Uwe Weiss – you are long-standing entrepreneur and the CEO of Blue Yonder, a predictive analytics company. Thanks for being with us. UWE WEISS: Thank you for having me. LUTZ FINGER: You landed a really large deal last year. Your company got funded by Warburg Pincus. The deal was for whopping 75 million USD – one of the biggest European investments in 2014. What does Blue Yonder do? UWE WEISS: We create predictive application platforms. We were founded in 2008. We offer predictive analytics for various industries. LUTZ FINGER: You used the words “predictive analytics.” That’s today one of those hype terms. You did not use the words “big data” – how come? UWE WEISS: You caught me. I think big data is a meta term like the expression “internet of things.” These concepts make data accessible. Big data as well as predictive analytics have been on the market for a while, but predictive analytics has traditionally meant means data mining and looking at past data. To expand, we needed an applications platform that helps decision-making based on analytics and large amounts of data. We are happy to work with in the “big data” wave and we are happy to work with the “internet of things,” but whatever we do, we need to prove the value that these terms might bring. LUTZ FINGER: Haven’t predictive analytics been around since the 80’s? We had business intelligence and everybody got excited about having big databases, which we didn’t call “big data” at that time. BI uses predictive analytics, in order to do something that is actionable. Now, what has changed since the 80’s? Except that we are all 34 years older. UWE WEISS: Many major technology trends really need a while until they find broad use and many things have to come together. You need time for new technology to finds its’ way into the market. We are now in the exact the right place. This is seen in the transition of business intelligence. First there was reporting, and then it was business intelligence analytics and visualization. Great companies have come out of this market, but what we understand about predictive analytics is that it is something that falls neatly into the mold of the big data scheme. With much better hardware we can run predictions on more data and faster. The software layout is transactional: the present source planning, warehouse management, order fulfilment, ecommerce execution and the analytical layout. These layers were traditionally separated in most software, from an architecture perspective. What is new is that these layers stay together, so analytics meet transaction. LUTZ FINGER: Nice. Analytics meets transaction. That’s “tweetable.” (Tweet NOW!) You are in a super “hot” spot right now. In the last year, I have noticed a lot of companies claiming a similar space. Earlier, you mentioned the “internet of things.” Otto is one of your shareholders, which is a big retail chain in Germany. Last year, Google Ventures invested $2 million in seed funding in Frame Data, to do user behaviour predictive analytics. And Reflection Capital, Intel capital and Nike made a big investment as well into startups supporting retailers. Lattice Engines got a $20 million investment, and they do marketing predictions. That’s a lot of big investments. And now, you, with $75 million. This is the top of the top. What makes the difference? UWE WEISS: The predictive analytics technology and concepts have been on the market for a long time, as we talked about before. It is still a relatively early market when it comes to the adoption and the enterprise level. We are talking about adoption cycles. Most people within the predictive analytics area try to find their way in the market using domain knowledge. We tackle the broader market of the underlying platform for predictive applications across domains. Generically, we have solved many of the tricky questions of data digestion, time series management, and the handling of lots of diverse machine learning algorithms because we don’t think that there is a one size fits all algorithm in the world. We believe in robustness and bring enterprise-level 24/7 usable consumable cloud software on top of service. We are not just a tool and we are not restricted to one domain. We are ambitious enough to say that we can tackle the free-to-form verticals based on scalable protocol – generic, predictive applications. LUTZ FINGER: In this market, there is the debate about how much domain knowledge is needed versus how much technology knowledge is needed. You have created a platform out of this technology knowledge and go one industry at a time, instead of building a solution around domain knowledge only. That’s the way you are tacking it? UWE WEISS: It is dangerous to remain in only one domain, because you tend to build your software architecture around your domain. You can run very fast and catch a lot of market share. But then you get stuck. We go for the broader perspective and we have seen that we can – with our people and our engineering – tackle more domains and add domain knowledge relatively easily. We usually don’t have to start from zero and are able to have vague domain specialties integrated into our platform rapidly. We don’t tackle all of the vertical markets. At the moment we focus on retail, consumer goods, completing our roadmap there, but we have a growing number of customers in travel, manufacturing and energy. If a new market looks healthy from a growth perspective, we enable ourselves to go into more domains. For our customers, that means solving more than one problem at a time. LUTZ FINGER: I published the book, “Ask Measure Learn.” I claim that domain knowledge is important in the “Ask,” which is the business-oriented part. What would make you guys different from the platforms that are out there already, like R-studio or SPSS? UWE WEISS: I see one difference between ourselves and other players. We learned early on that there is a market for tools, applications and solutions. If you tackle this market, you will always be a part of critical enterprise processes like pricing, replenishment, customer management, and customer complaints. You have to build a platform with high availability – 24/7availability – and have to have super robust machining algorithms and domain knowledge. There has to be a transactional layout. That means we don’t only have the findings and insight, we also execute milions of transactions for our customers. We set the prices in their e-commerce platforms, we make replenishment decisions and so on. The transaction volume and throughput comes into play. When you have customers which process hundreds of millions of transactions per day per customer, you have to have a scalable platform which does not only contain the insight part, which you probably would call the “measure” part and “learn” part, but you also have to have the transactional part that can execute transactions and permanently integrate data sources into a streaming process. You also have to make decisions. That’s a differentiator we see in the market, and we see the market moving more and more towards supporting companies to become predictive enterprises. It’s great to have predictive analytics insights, open source tools or other available tools, but in the end, when you have these great insights, you want to transact and want these insights to become a part of your transactional software landscape. And that is the path we are following in the market and that is the right one for us. LUTZ FINGER: There are two approaches here. One approach is to use domain knowledge and create a specific solution. However, in enterprise software terms, it becomes harder to scale; therefore, you built the platform with the scaling piece and with domain knowledge. You scale up and enable mutual frameworks for everybody. UWE WEISS: Our theory is that 99 percent of operative business decisions can be automated, and to automate these decisions, you need predictive analytics. You also need the automation piece and the execution piece, the throughput and the scaling piece. You need to be able to take all of the bits and pieces in an architecture together to make a complex configuration: data signs, learning, machine learning, in memory databases, time series robustness. Add this to enterprise release management and software release management. With these components, you have a platform which can also execute on analytic insight and automate. We tell our clients, “99 percent of your operative business decisions can be done automatically; the exceptions are the ones you should work on with your team.” 99 percent of decisions today are the same decisions you have made in the past. This means you didn’t learn from the data. The automation piece is essential for the usage of predictive analytics, so we see the tendency of analytics offerings getting into this transactional execution market. We also see enterprise software companies trying to glue on predictive analytics pieces. LUTZ FINGER: So we are scaling up because we are using enterprise software, and we are automating the “science” aspect of this area of expertise. UWE WEISS: Amazon, for example, has a recommendation engine with automated processes. They are the masters of business decision-making and recommendation automation. They are also the masters of using science and the enterprise software landscape. LUTZ FINGER: I was slightly surprised to see that the investment was provided by Warburg Pincus, because they are known as a private equity company. All of the other deals I listed out were made by venture capital companies. How come? UWE WEISS: In looking at the maturity of the technology, many of the VC’s have made their early stage investment in predictive analytics offerings. These successful companies are already in a place of growth and not in the seed or early phases. The technology today is is ready-to–rock for an exponential growth – the technology can be applied widely. Private equity investors have seen that and they believe we are operating in a very sustainable growth market. It is healthy in terms of growth and independent from any short-term cycles or hype terms like “big data.” They see that large enterprises and many verticals require predictive capabilities. Predictive analytics is at the core of many services and initiatives. VCs have seen the opportunity in the market. We are convinced that predictive analytics is something all large enterprises and also fast-growing enterprises will use in the near future. Private equity companies believe in the long-term possibility of this market and that this market is growing independently from cycles or economic downturns. I don’t think that their investment is fashionable; I think it’s because of their fundamental belief in this sector. LUTZ FINGER: You noted that BI has been around since the 80’s, but that it takes time off adaption. When we look at scaling up, we see the availability of data, we see that the machines are there, and therefore there is a scale effect which manifests itself in enterprise software. UWE WEISS: Yup. The whole sector of analytics is capturing more market share and enhancing BI. Approximately 95 percent of BI budgets went into reporting, visualization and dashboarding. BI. This is a healthy, multi-billion dollar market with nice growth rates in a growth phase. That is important to private equity. In an economic downturn, enterprises will still run this software and pay for it. If you have embedded critical enterprise process – like pricing, replenishment, logistics, supply chain yield management – you are fairly independent from economic cycles because people buy food, people go into restaurants, people go into a train or have to buy a ticket, and so predictive applications will have their space. Fundamental belief in predictive analytics as a growth area is responsible for private equity entering this area. You will see more private equity deals, I think. Fast growing software service businesses need substantial investment to grow. This phase of the market has become attractive for private equity, and because of the ticket size and the growth, predictive analytics companies can improve right now. LUTZ FINGER: Got it. The first thing I thought when I saw your deal was that it proves the Gartner hype curve wrong. In the Gartner hype curve, he says that predictive analytics is at the top of the hype cycle. That would suggest that we will soon be slowing down. What you are saying is that we are in a stable situation. We are on the far end. Predictive Analytics is ready and we can roll it out. UWE WEISS: I fundamentally think that the technology is at the “plateau of productivity”. People can use this technology now and produce ROI. Analysts talk about prescriptive analytics already. A week ago, Davenport published an article on “Automated analytics.” I like this term – meaning that the analytics layout marries the transactional software layout. Predictive analytics are not for a homogenous market. The tools have been in the market for a long time. Many people talk about machine learning and one size fits all algorithms right now in regards to various learning technologies – supervised learning, reinforcement learning, and deep learning. You need to be capable of working with all of these learning technologies, but we also need to be capable of embedding it into enterprise processes. To do that, you need material software. Your software has to work for many years. For example, building enterprise software hasn’t changed much in the past years. The fact that you are building robust enterprise software infrastructure is something that you still need to prove to your customers. This has not changed. LUTZ FINGER: I totally agree. What will we be seeing next from Blue Yonder? You said that some of the funding will be used to internationalise and expand. You’re very well-known in Europe, and definitely super well-known in Germany. This investment was the biggest deal in Germany in the last year. What can we expect to see next from Blue Yonder? 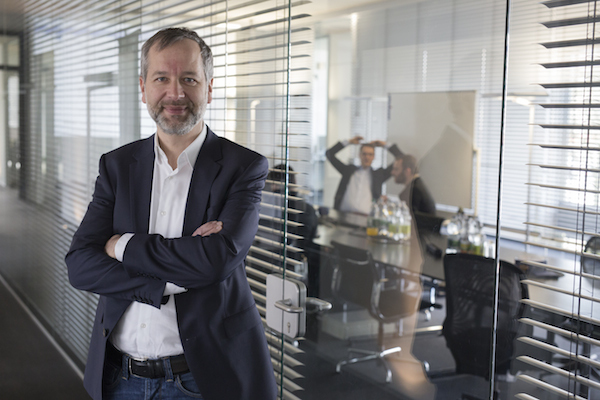 UWE WEISS: We did the biggest software deal in Germany in the last year and one of the five biggest software deals in Europe, excluding ecommerce and also technology enabled businesses. We are based in Germany, the UK, and have a substantial operation also serving the Nordic countries. I think we foresee expansion into the US in 2015 and we already have a few interested customers in the US. I am convinced we will have our foothold in the US in 2015. We are one of the next companies coming out of Europe that will become international by also being established in the US. I think we want to keep a healthy mixture of European style and American style. We are also looking into Asia and the Middle East, but we want to place our bets on the right areas, so America is definitely the next step on our internationalization roadmap. Product-wise, we will focus on the domains we have defined for ourselves. This gives us a lot to do for the next 24 months. I am convinced that we will see a mass market for predictive applications from 2016 onwards. All of the global 2000 Leading Companies in all relevant industries will need to adapt and use it. LUTZ FINGER: Wow, that’s a cool prediction. I am going to go with that one. Thanks a lot for being with us. This entry was posted in Blog on February 10, 2015 by Lutz Finger.